Who’s next for Jake Ellenberger if he defeats Rory MacDonald? This isn’t my top pick for Ellenberger if Koscheck wins, but it would still make some sense. Koscheck is a perennial contender, and even though he got knocked out his last outing, if he beats Maia impressively he is effectively “in the mix”. On the other hand, if Maia comes out victorious, he is either the number one contender, or a fight away from a title shot. 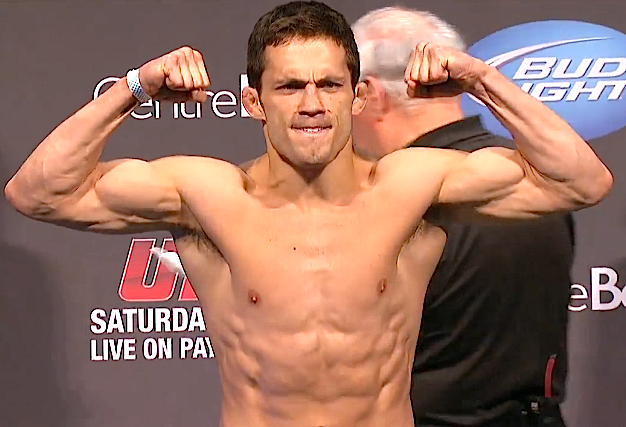 I really like the matchup for Ellenberger if Maia picks up the W at UFC 163. If Ellenberger comes out and finishes Rory Macdonald, there is no doubt in my mind he’s going to want a title shot. In my opinion, he is still one win away after beating MacDonald. A fight with either GSP or Hendricks would be a great one. In the most likely scenario of Ellenberger taking on Hendricks, you have two phenomenal wrestlers with powerful hands going head to head in what’s sure to be a slug fest. If Hendricks pulls the upset, a matchup between a hungry GSP looking for the title and Ellenberger would also be highly entertaining. The two and only men to defeat Ellenberger in the UFC are going head to head on UFS1. If Condit takes the rematch and it’s in a dominant fashion a number one contender match-up with Ellenberger would make a lot of sense. Ellenberger lost a closely contested split decision to Condit in his UFC debut, and there is no doubt he would love some revenge. If Kampmann wins a rematch with Ellenberger it would be a fan’s dream come true. Both men are exciting and have knockout power. This would make a great co-main event on a free card and possibly as a title eliminator. So it’s quite obvious that winning the matchup with MacDonald on the 27th of July would provide Ellenberger a plethora of opportunities to advance his career. I believe that with an impressive victory at UFC on Fox 8 Ellenberger should be placed in a number one contender fight. Depending on how the Welterweight division shakes out in the coming months he may even be awarded a title shot against the winner of GSP vs. Hendricks. Where do you think Ellenberger stands with a win on the 27th? Should he be placed in a number one contender’s spot? Or should he be given an automatic title shot? Or am I completely wrong and Ellenberger is overhyped? (This is obviously not the right answer). Feel free to leave your feelings below in the comment section, and don’t forget to “like” and “share” this article.